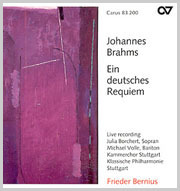 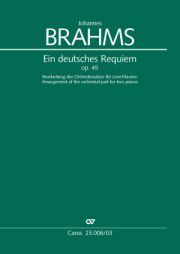 Since its first complete performance in 1868 in the Cathedral of Bremen, Brahms's Ein deutsches Requiem is, without question, one of the key works in the history of the oratorio. 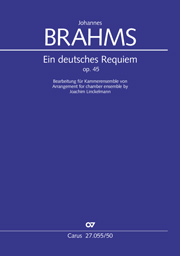 The reputation of the work is based not only on its unusually concentrated musical structure, but also on the original conception of the text: Brahms assembled important passages from both the Old and New Testaments in Luther’s translation so that thoughts on sorrow and consolation would obviously refer to one another. 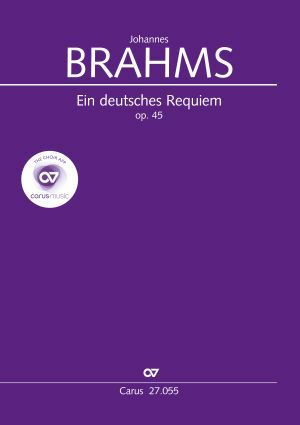 In contrast to many other oratorios of the 19th century Brahms places the choir, the voice of the community, in the center of this interdenominational celebration of the dead. 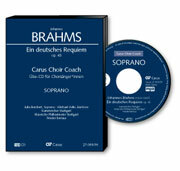 Also available in carus music, the choir app. 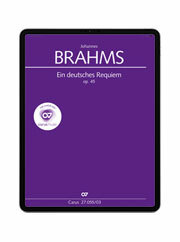 [...] Dieses grandiose Werk gehört sicher zu den Top 10 der musica sacra mit enormem Tiefgang. 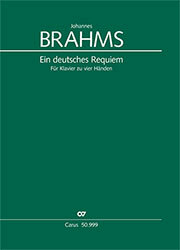 [...] Mit der sorgsamen Edition von Günter Graulich liegt nunmehr eine ausgezeichnete Grundlage für Aufführung und Studium des Deutschen Requiems vor.